Hostal Mindanao is located in Salamanca (City declared a World Heritage Site by UNESCO), next to Fonseca Cultural Center, and 5 minutes walking to: the Palacio de Congresos y Exposiciones de Castilla y Leon and the Plaza Mayor (one of the most beautiful and grand of Spain (Unamuno called Plaza Mayor 'heart full of sunshine and air'). We keep free all the day your luggage while you are visiting Salamanca. As a gift you may choose: the second drinks free or discounts on spa services, depending on the season. Free parking zone for cycle, motorcycle, and cars. An excellent choice for tourists, professionals, groups and families in a city of legendary culture, good gastronomy, nature and great variety for leisure. There are around two natural parks with abundant vegetation and three hospitals. It has 30 rooms with private bathroom, TV and heating. Pets are welcome. Free Wi-Fi. Good relation quality - price. Partner with the Spa Center Aquatherapia and Ski Resort La Covatilla (consult supplement). The property is solidarity with the environment ( eco- friendly property ). Our property offer special room for handicapped people. Property Mindanao is ideal for City Break, bike ride, and so on. Cancellation policy ; 48 hours prior arrival. For national holidays in Spain the cancellation should be 7 days before arriving. The University of Salamanca is a jewel of Renaissance art and a world reference, Convento de San Esteban Dominicans: visited by Christopher Columbus, St. Teresa and St. Ignatius of Loyola, The Clergy: monumental Baroque building erected by the Jesuits in the eighteenth century , today seat of the Universidad Pontificia, The Cathedrals: historical - artistic, including the cathedral and the old new cathedral, Casa de las Conchas: one of the finest examples of Gothic civil architecture Spanish, La Purisima: church and convent built by Italian artists Fangazo Cosimo and Bartolomeo Picchiatti; Palacio de Monterrey; Convento of Dueas, the Roman bridge crossing the river Tormes, the Automotive Museum, Lyceum Theater, Center for Performing Arts and Music, Domus Artium, Natural Park of Batuecas and the Sierra de Francia etc. A hour to get Portugal. Salamanca is very famous by a great variety of restaurants ( traditional , regional, design, vegetarian food ), bars, disco pub ( for example La Camelot , and so on. You will enjoy an special wine and delicious local products: Iberian ham, chafaina, cabrito asado, cheese, hornazo, cochinillo al fuego, farinato, chochos ( dulces anisados) , bollo maimn, and others. There are bike tours, exhibitions of handicrafts in different places. 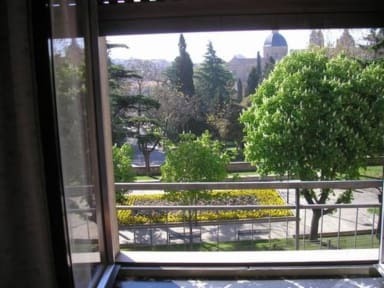 There are a many Spanish language courses during all the year, guided tours of morning, afternoon and evening by Salamanca. Wide variety of conferences and events on different social, medical issue. - All the shower and washbasins taps have dispenser of water volume. - All the personnel recycle every day: paper, glass, plastic, batteries, cartridges, etc and other residues in five different small containers and at the end of the day each product the personnel bring them to the corresponding big containers outside the property. - The personnel works with a t-shirt with green and white logo looking for the help of all the guests for taking care of environment. - In each room there is a document with the environment policy translated to several languages. 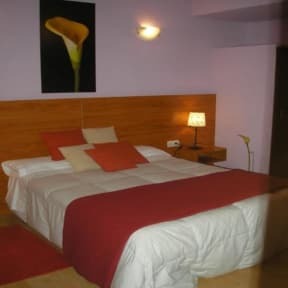 - In the leaf of check in to the also specific back the policy of the inn to take care of the environment. - Every day we put more light bulbs of low consumption. - In the cleaning of the Property we use biodegradable products with neutral pH with the trade mark Johnson Diversey. - All the possible paper is recycled in the reception. - In the foot of the electronic mail, in the business card of the Property and in all the documents of the Property we request the collaboration with the environment. - We are member of two Organizations that take care of pets: one in Madrid and other in Barcelona. - The care of the environment is a culture subject and that all we must learn every day.